Cynora and LG Display will renew their joint development agreement signed in 2016 allowing for continued development of TADF emitters for OLED displays. The extension is expected to be for two years, which is Cynora’s timeline for full commercialization of a blue triplet emitter. Cynora and Kyulux have been working on the development of TADF materials for a number of years and both include LG Display and Samsung Display as investors as well as a number of smaller display manufacturers and VCs. The development of alternative emitters to replace the fluorescent blue and the phosphorescent red and green would help reduce material costs and royalties charged by Universal Display. However the UDC license agreements with both LGD and Samsung extend thru 2022. UDC claims to have a high performance blue under development but has been reluctant to provide any information on the status of the emitter. The replacement of a blue fluorescent with a triplet emitter material, could reduce power consumption by ~20% and extend lifetimes according to UDC. 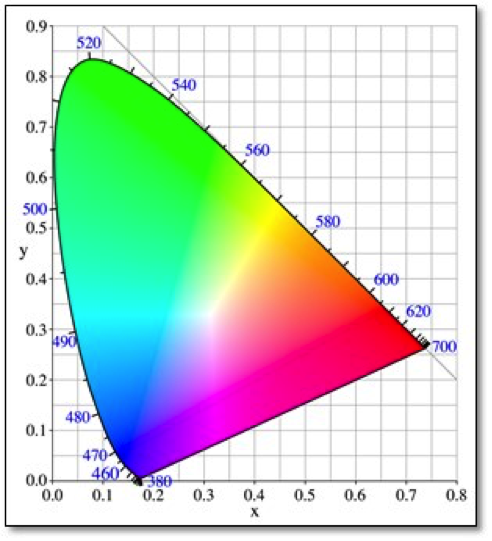 CIE Color Model – CIE color space model was developed in 1931 by the Commission International de l’Elcairage (CIE) is a three dimensional representation of the standard wavelength for visible light (380-740nm. Typically, points on the model are indicated by X & Y coordinates or in nm. EQE – External Quantum Efficiency measures the light that can be seen by the viewer. 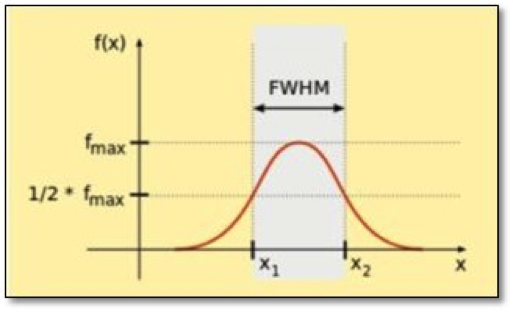 Figures for EQE are not very meaningful unless they are accompanied by an explanation of how all the layers in the OLED stack, since the refractive index of the glass, the use of internal and external light extraction materials markedly affect the EQE. A more meaningful figure is candelas/A, which is a measure of efficacy. Lifetime – A measurement of the remaining luminance over time. For example, T90is the time it takes for the OLED to produce only 90% of its original luminance at a give original light output, typically measured in cd/m2or nits. Since red and green phosphorescent reach t50the standard specification for displays in hundreds of thousand hours, panel makers look to a measurement of T97or T95to determine the T50lifetime using extrapolation. The table below represents some of the most recent TADF material specifications available. The first entry is for a blue fluorescent emitter material that is currently used by panel makers. The current commercial fluorescent blue emitter with host meets these specs. The table below shows the current status of the TADF and TADF derivatives based on the reports made at the OLED Summit by Kyulux and Cynora. Claims 460 nm, but the CIE coordinates indicate a higher wavelength. 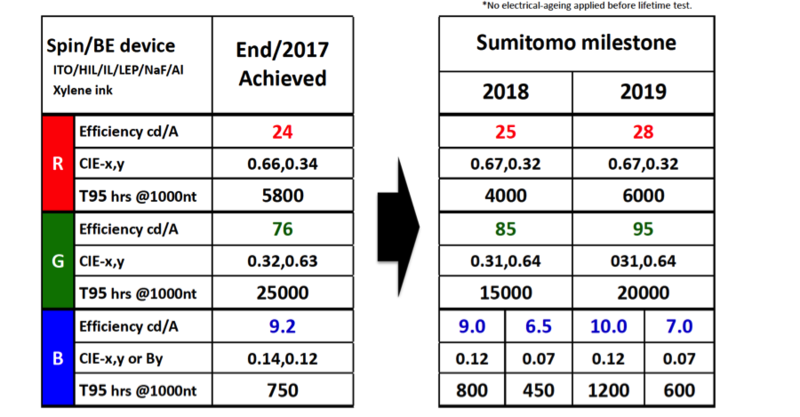 ​Sumitomo showed the following performance figures at the OLED Summit. Cynora showed the following charts describing their blue material at the OLED Summit. ​Kyulux did not release their slides to the attendees, but they provided no details on their blue material. Basically, the status of a triplet emitter blue is that none presently meet the specs of the current fluorescent blue and if history is any predictor a high efficiency long lasting blue is still years away, despite the claims of the TADF and Polymer producers.